On June 13, 2014 we had a Full Moon. I caught it rising over the south slope of Gavilan Peak, a mountain just east of where I live. And as with most mountains in the Sonoran Desert, the south slope, which enjoys the most sunlight, is where the majestic saguaro cactus lives. As the Moon rose, a group of large saguaro were silhouetted against its glowing disc. The Moon’s ruddy color was due to its low altitude in the sky, an effect often seen at moonrise and moonset. The same thing often happens with the rising and setting Sun. For an explanation of this effect, see my July 1, 2011 post. I used a 200 mm telephoto lens set to f/32 on my Canon EOS-20D, with ISO 100 and t = 1/20 s. It was windy that evening, with gusts to 50 km/hr (30 mph), so the tripod was swaying and the image slightly blurred. Still, you can see individual flower buds on the crown of each cactus, as well as some adjacent brush. I’m fairly certain the cacti were swaying too. Considering they were about 500 meters (1/3 mile) distant, these are reasonably good images. The left image is the earliest in the sequence. With the Moon below the top of the tallest saguaro, it almost looks like the Moon is split in two. 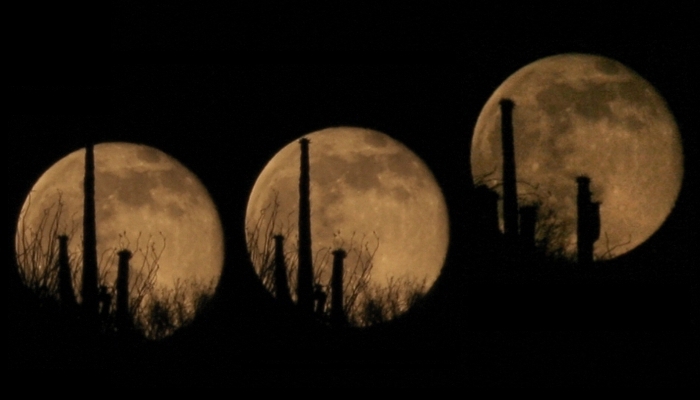 The middle image is about 1 minute later, and shows the upward motion of the rising Moon. I think it’s the best of the three images, and the least blurred. A careful observer might object “Hey … that third image has a different group of cacti.” That’s correct. After the Moon had risen even higher, and the silhouettes were no longer interesting, I picked up the tripod and moved 10 meters north. At 500 meters from the mountain, that move caused enough parallax to hide the Moon behind the mountain again. And it started a whole new moonrise sequence. Alas, my new location was even windier, so the third image is the most blurred. You might wonder just how often this happens. From my point of view, on average, there’s 3 months every year when this arrangement unfolds. It will happen again this year on July 12 and August 11. In the other months of 2014, moonrise is too far south or north of the mountain. Next year, it’ll be a different 3 months, but they are always consecutive. I’ll try shooting another sequence in July. Hopefully it will be less windy. The path of the Moon through the sky, and the points where it rises and sets, are the result of a complex combination of several astronomical cycles. Fortunately, there are astronomy apps available (many free) which do the math for you, and can display an image of the sky showing the path of the Moon for any date or location. So I knew this was going to happen, and had the correct group of saguaro in frame well before moonrise.